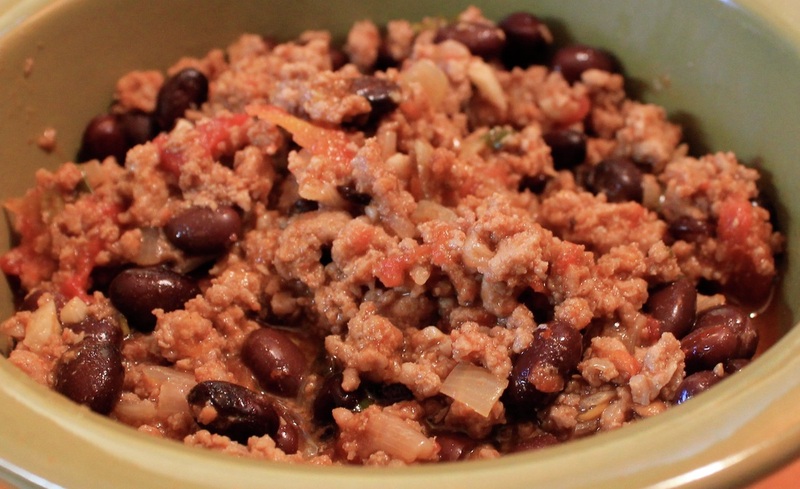 This is a flavorful chili without being too spicy. Make sure you simmer it without a cover so it thickens up. Heat a large saucepan over medium-high heat. When the pan is hot add the oil and saute the onion and garlic until tender. Add the ground meat, stirring until cooked. Add the Worcestershire sauce, beef bouillon, chili powder, red pepper, bay leaves, cilantro, cumin, oregano, thyme, and basil. Cook for 1-2 minutes stirring well. Add the tomato paste, diced tomatoes, black beans, and beer bringing to a boil. Reduce heat, and simmer uncovered for 1-1/2 hours or until thickened. Remove the bay leaves before serving. You can easily substitute dry beans using one of the cooking methods here.